Weird Rain (Installation View). Image courtesy of Garden, Los Angeles. Photo: Jeff McLane. We thought our human relationship to the natural world was an ouroboros; a wager for which would destroy the other first. 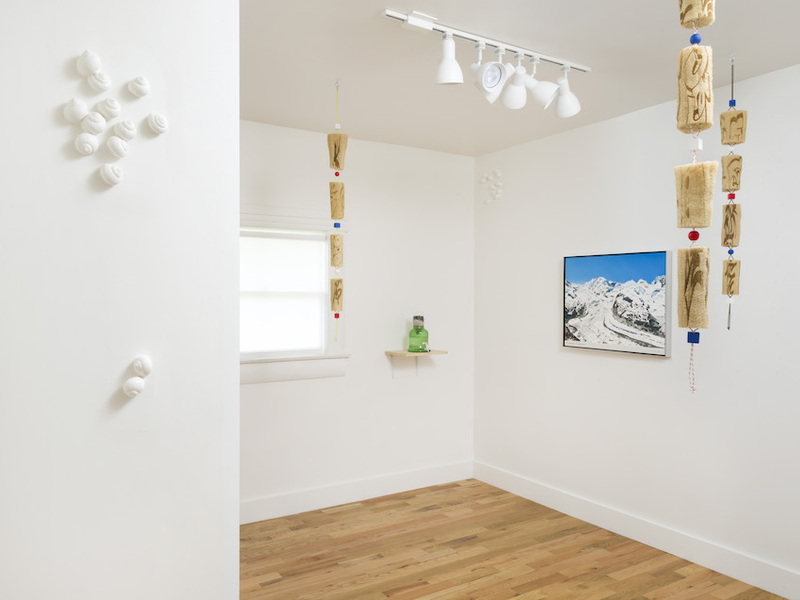 In Weird Rain at Garden, an apartment gallery in Echo Park, five artists consider the body as an ecological site in the age of global warming. Neatly installed, Weird Rain functions like an observable, intricate biome. 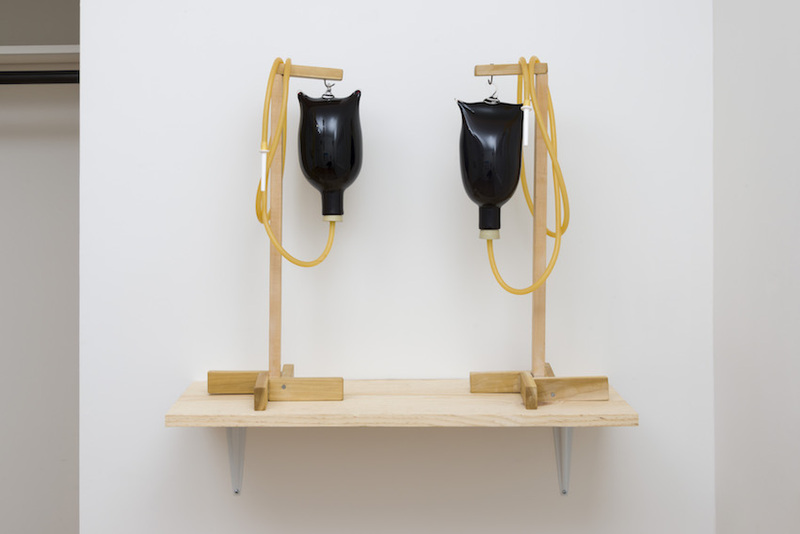 laub and Jennifer Moon present mouth-blown glass enema bags tinted dark red, like blood. In GFT (Gut Fairies Transplant), Phoenix Rising, Part 3: laub, me, and The Revolution (The Theory of Everything) (2015), a feasibility of the sculpture’s utility alludes to an intimate and alchemical exchange. On the wall, a shimmery aluminium print depicts a sensual plant ritual. The photograph, by Sarah Manuwal shows horned silicone hands fondling fleshy houseplant vines. 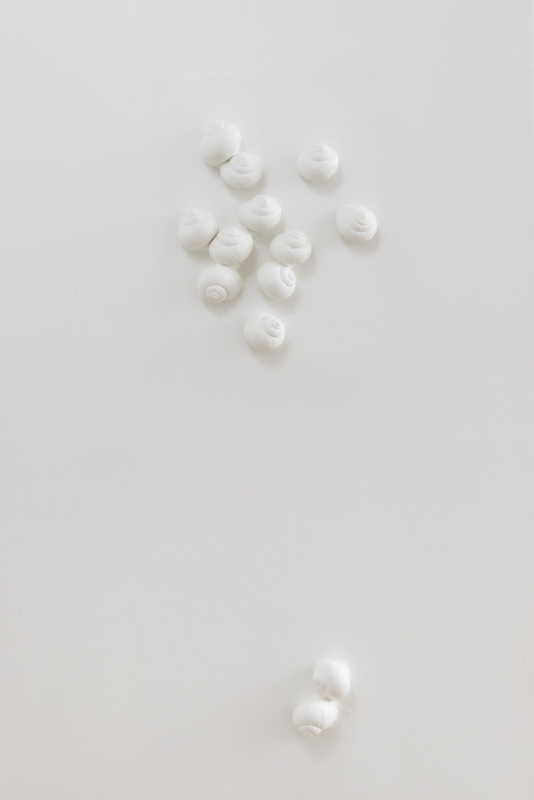 Throughout, clusters of pale plaster-cast snails perch in three points on the walls in Introverts (2017) by Brody Albert. Each honors interiority with tenderness, and if the body is a biosphere, home was first the womb. The work conjures a quiet moment—a reminder that a gallery show lasts as long as a jacaranda bloom— though ecological disaster is permanent. 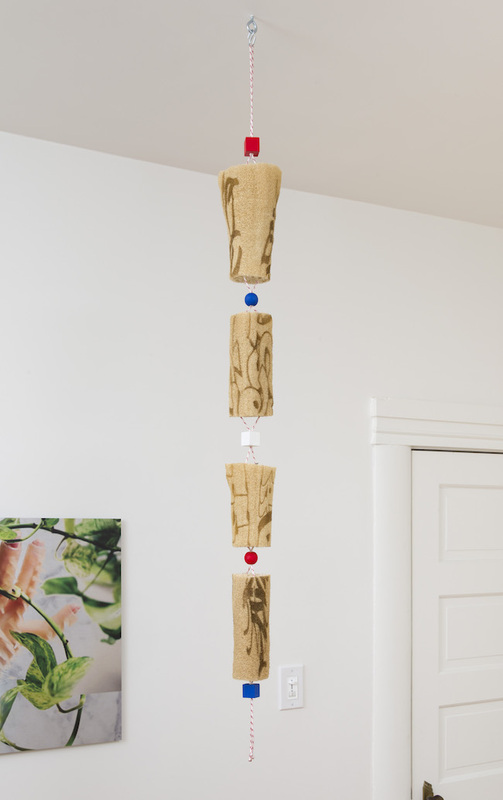 Spencer Longo’s loofah sculptures, LEXI (Redux 1-4) (2014/2017) dangle from the ceiling like soundless wind chimes, strung with primary blue and red wooden blocks. A loofah is not a sea sponge, but a domesticated gourd plant that early humans used to clean themselves—the crust of the earth and the layers of the human body are not so different. In Weird Rain, materiality and form position the human body back into a seasonal cycle with nature. Skin flakes as dust and melts into air; our bodies will be fertilizer eventually. For now, the sun sets and all of Echo Park smells like jasmine. Weird Rain runs May 6-July 6, 2017 at Garden (1345 Kellam Avenue, Los Angeles, CA 90026). 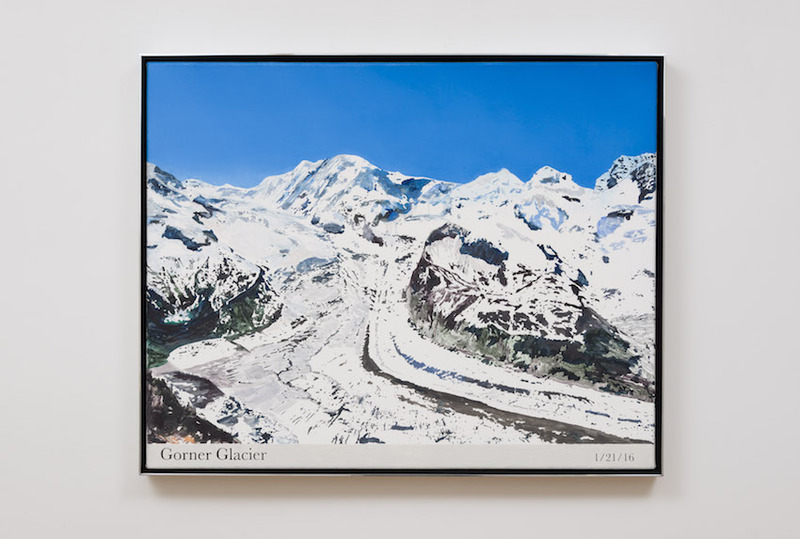 Rob Reynolds, Most Painted Mountain (Gorner Glacier) (2016). Oil, alkyd, and acrylic paint on canvas in welded aluminum artist’s frame, 24.75 x 30.75 x 2 inches. Image courtesy of the artist and Garden, Los Angeles. Photo: Jeff McLane. laub and Jennifer Moon, Enema bags from GFT (Gut Fairies Transplant), Phoenix Rising, Part 3: laub, me, and The Revolution (The Theory of Everything) (2015). Mouth blown glass, wood, vinyl tubing, 23 x 12 x 8.5 inches each. Image courtesy of the artists, Commonwealth & Council, and Garden, Los Angeles. Photo: Jeff McLane. Brody Albert, Introverts (2017). Plaster, Dimensions variable. Image courtesy of the artist and Garden, Los Angeles. Photo: Jeff McLane. laub and Jennifer Moon, Water filter from GFT (Gut Fairies Transplant), Phoenix Rising, Part 3: laub, me, and The Revolution (The Theory of Everything) (2015). 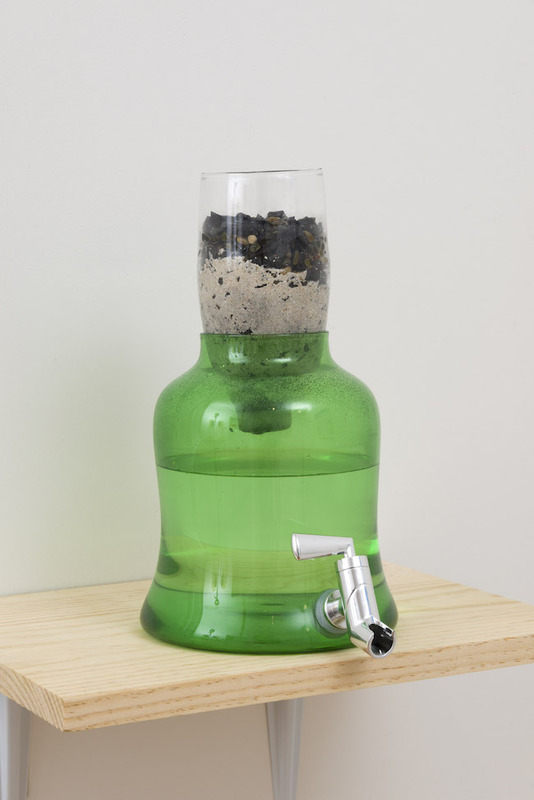 Mouth blown glass, rocks, sand, charcoal, filtered water, 11.5 x 6.5 x 8.25 inches. Image courtesy of the artists, Commonwealth & Council, and Garden, Los Angeles. Photo: Jeff McLane. Spencer Longo, LEXI (Redux 1) (2014/2017). Loofah, nylon cord, wood beads, enamel paint and hardware, 54 x 4.5 x 5 inches. Image courtesy of the artist and Garden, Los Angeles. Photo: Jeff McLane.